Junior Hyde Mendoza waters plants that were up for sale at the FFA plant sale. Summer is just around the corner, and so is gardening season. 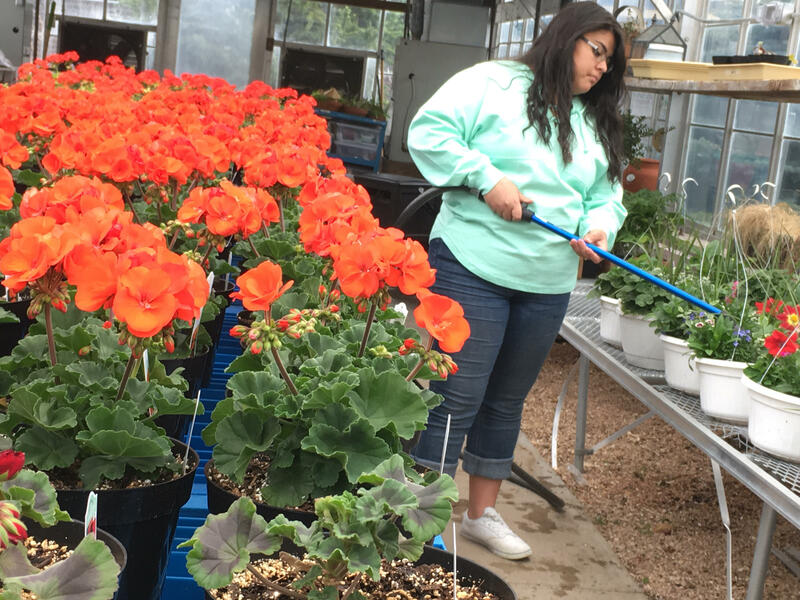 That meant it was time for the horticulture classes at West to host the annual FFA Plant Sale that has persisted as a decade long tradition. This year, they expanded on last year’s event by opening an additional greenhouse. With the growing program and involvement, Ms. Samantha Maxwell reported that next year, they will be able to add another greenhouse to bring the event to a full three building set up. Students from Horticulture 1, 2, and 3 grew the majority of the plants from seedlings, and repotted them as they grew. As the primary caregivers, the students were responsible for watering and nurturing the plants. Horticulture students ran the event under the supervision of the teachers, as the exchange of money is involved. Maxwell said she is most fond of this aspect of the event because she can, “watch the students engage in customer service and be productive members of society”. Shoppers chose from a variety of flowers including geraniums, bacopa, and petunias, as well as an array of mixed flowers in hanging baskets. For supporters looking to start a garden or save money on produce, the sale also offered fruit and vegetable plants including tomatoes, peppers, kale, and broccoli. The prices of available plants varies based on species and size, but all funds raised from this event will be used to fund projects and activities within the horticulture classes. A portion of the money will also be used to continue the upkeep of the greenhouses that helped make the plant sale possible.